The hot evening sun beats down on the green grass where my little dog is tracking a nearby squirrel. His long hair is a little much for the heat. As the temperature and humidity climbs, the UV index raises and the sun lingers in the sky just a little longer every day, he'll need to be shaved so that he can venture out into the yard with more ease. Fireflies begin to hover as his wet nose traces the ground, glittering over the yard in the dusk. In the dim, yellow hue of the final rays, the solstice celebration begins. The Summer Solstice occurred at 5:07 in the morning on June 21st, but it's common for celebrations to begin at sunset the night before when the fae come out to play. The next morning, we welcome the rising sun and celebrate its life-giving light through sun-catchers, sun wheels, bonfires and more. Grilling, picnics and feasts are as common as sun tea, sun mandalas and flower crowns. This is a day to celebrate our successes and our strengths with enthusiasm and life. It is the longest day of the year. For this altar, the only man-made element is a yellow taper candle I've used at the top-center of the altar. The rest of the items placed on the altar were found in my backyard during a quick scavenging. Yes, everything else, including the little surprise animal element. Lately, I have been bestowed a number of animal parts by the spirits, from a bird wing to a moth. This rabbit's head is the latest addition. It's still in the process of breaking down but I wanted to honor this gift through this summer altar. Rabbits are a symbol of fertility, luck and spontaneity. 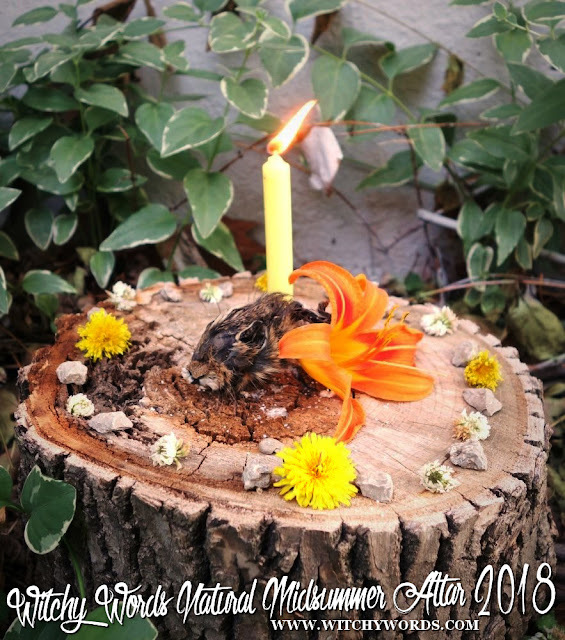 Fertility is particularly appropriate during the solstice as we honor the fertile land that's about to bear its fruits for the first harvest holiday in August. 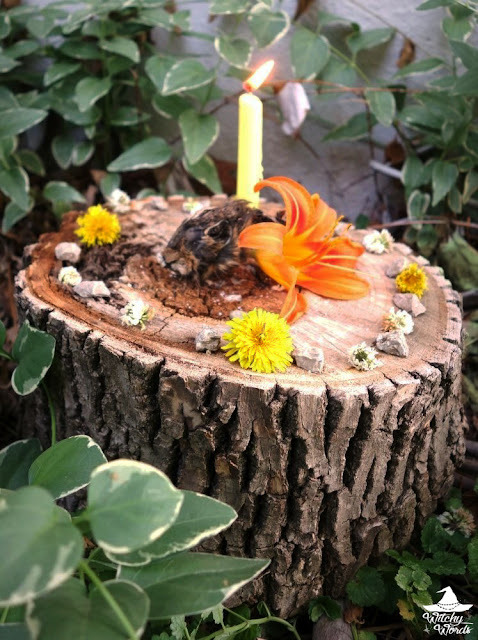 Spontaneity is equality appropriate as the natural altars are naturally spontaneous - put together in just 10 minutes and only with what I already have available to me. I paired the rabbit's skull with a tawny day lily from along my yard's fence. Day lilies are particularly special because each flower only blooms once, hence the name. They grow in bunches, with several flowers ready to bloom each day, but each individual flower is transient. Temporary. Fleeting. Just like the life of the rabbit. This orange flower is perfect for the fire of the sun, representing strength and courage alongside its other symbolism. Even more so, in China, day lilies are connected to motherhood and fertility, again emphasizing the fertile land of the solstice. Behind the rabbit skull and day lily, I propped a yellow taper candle up with stones. Yellow is symbolic of the sun we honor during the solstice. Lit, the flame connects this candle with the heat and bright light of the summer. In front of this trio sits a gastropod fossil found among the rocks collected. Likely once a snail shell, the spiral it creates connects the journey of the sun to the land of our ancestors - a solar symbol of continuous life, and a common representation I've used in Midsummer altars seen in the past. 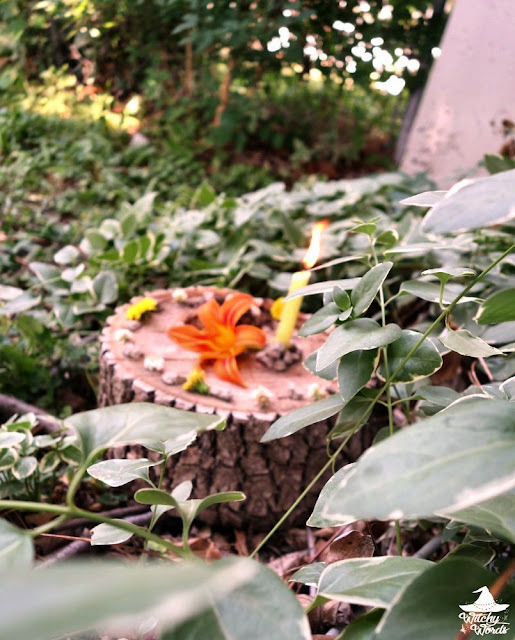 Around the altar, I built a circle of flowers and stones. A total of twelve stones make up the circle, each one representing a month in the year, the passage of time and the cyclic nature of the seasons. 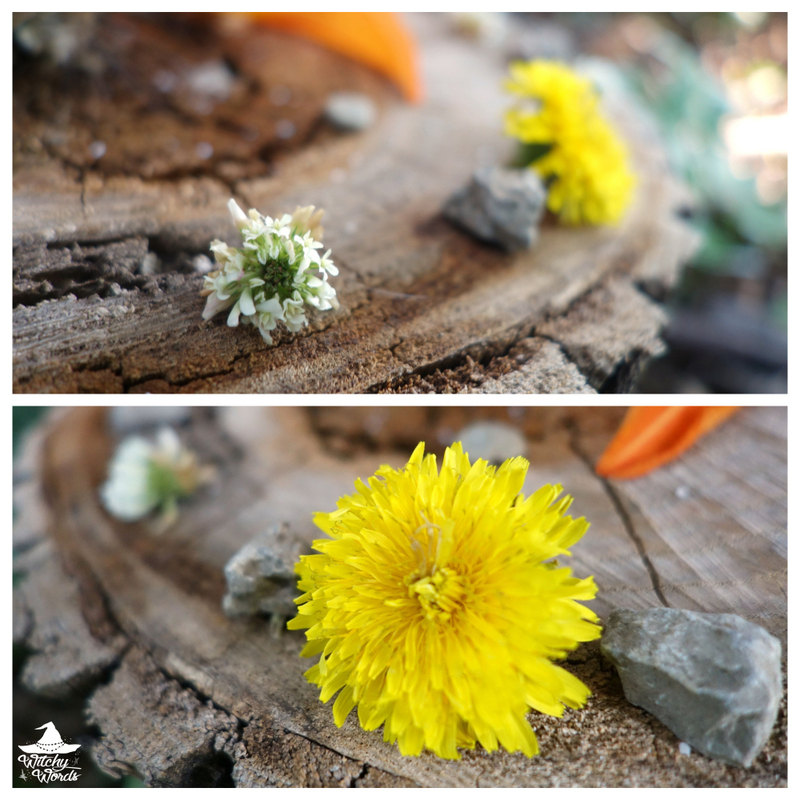 In between each stone, I placed dandelions and white clover buds. The dandelion blooms were used at each quarter, creating a visual sun wheel, and stationed in order from bud to full bloom counter clockwise, representing the shorter days and longer nights that will occur from here on out. Dandelions are common rabbit food, their yellow color linking them to sun and happiness. The white clover flowers placed in between each the dandelion blooms creates a ring of protection and luck. Clover is also common in a wild rabbit's diet. Overall, this altar is dedicated to life - bestowed upon us by the sun and fertile land, enthusiastic and cyclical, yet transient in nature. This is my thanks given to the rabbit's spirit and those who bestowed this gift upon me. I hope everyone had a wonderful solstice!